The collarbone is also known as a clavicle. It is located between the rib cage (sternum) and the shoulder blade (scapula), and it connects the arm to the body. Clavicle fractures can be very painful and may make it hard to move your arm. There is usually an obvious deformity, or “bump,” at the fracture site. The bone may push the skin into a “tent” formation at the break, and may even break through. Broken collar-bones can and do heal on their own. If the ends are well aligned, I usually let it heal. I usually provide you with an arm sling for comfort. Whether treated with or without surgery, regular evaluation is important to make sure the healing is progressing and the position is maintained. If the fracture has more than two fragments, the fragments are too far apart, or the overall length has become too short, I may offer you surgery. The idea is to re-position the bone into normal alignment, and then hold it in place with a ‘plate and screws’. After surgery, you may notice a small patch of numb skin below the incision. This numbness will become less noticeable with time. Because there is not a lot of fat over the collarbone, you may feel the plate through your skin. Plates and screws are usually not removed unless they cause discomfort, such as when wearing seat-belts and backpacks. People who use any kind of tobacco product, have diabetes, or are elderly are at a higher risk for complications during and after surgery. There are risks associated with any surgery. Some risks involved are related to any type of orthopedic surgery. 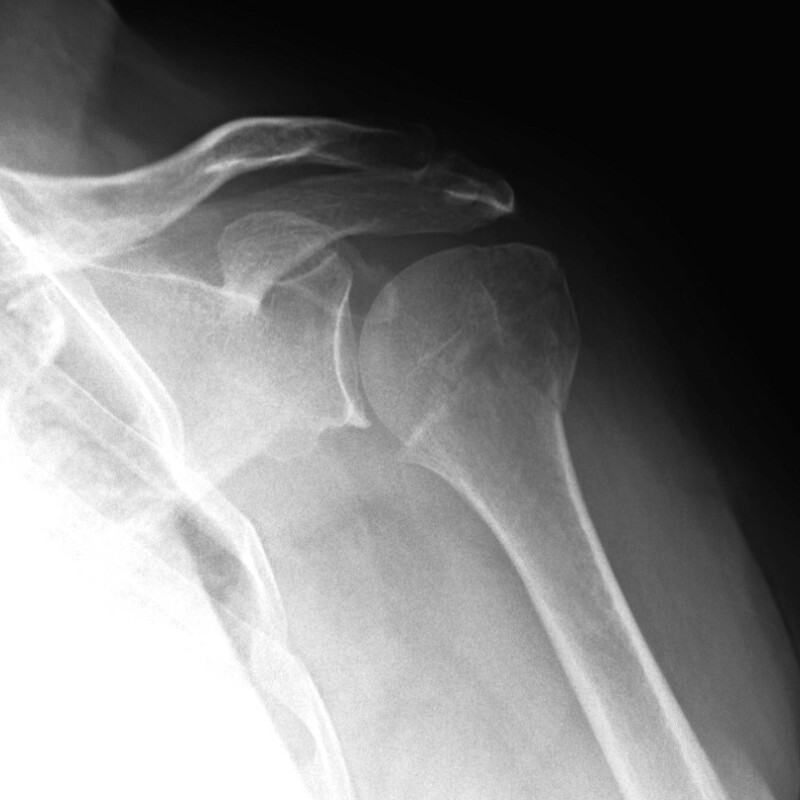 Risks specific to to surgery for collarbone fractures include difficulty with bone healing and breaking or bending the plate if you go back to normal use before the bone has had the chance to heal completely. Whether your treatment involves surgery or not, it can take several months for your collarbone to heal but the average time is usually six weeks. It may take longer in diabetics or people who smoke or chew tobacco. After the bone has healed, I will gradually release you back to your normal activities usually over 2-3 months depending on the type of activities you do. It is important to give it enough time to heal. The Proximal Humerus is the top, rounded part of the arm bone. It is frequently susceptible to fractures, usually with falls directly onto it. Luckily, most of these breaks can be treated without surgery. If we have discussed surgery, I may have offered you to fix the fracture, or replace the broken part. If your fracture does not require surgery, treatment starts with rest and protection, usually using an arm sling. I usually let you take the sling off a few times a day to stretch your elbow and clean under your arm pit. It is usually not safe to move the arm around as the pieces may shift and then make surgery necessary. After a couple of weeks, I would show you simple arm swinging exercises but would still ask you not to use your arm actively. At the end of the forth week I would let you do more with it within comfort. You may not need the sling at this point. Weekly or biweekly x-rays are important to watch for any shift in the pieces. While you are recovering from the fracture you may develop bruises down your arm- this is expected and will go away. Your hand and fingers may get swollen and stiff. We need to prevent that, and the easiest way to do it is to keep exercises you hand and wrist using putty or a squeeze/stress ball. For those fractures that need surgery, there are two broad types of surgeries available: Put the pieces together and fix them, or consider them unrepairable and replace them. Many a time, the broken pieces that have shifted keep the potential to heal properly yet need to be put back where they belong. If that is the case, I may offer you to go to surgery, and realign them and then hold them in place with plates and screws. Having said that, there is no surgery without risks, and we have to weigh the current situation, future expectation, and potential problems we may face. X-Ray of the proximal humerus (the ball) and the socket, following replacement of the ball and fixation of the socket. Sometimes the fracture may disrupt the blood supply to the broken piece, or there may be too many pieces to be able to be put together and fixed. 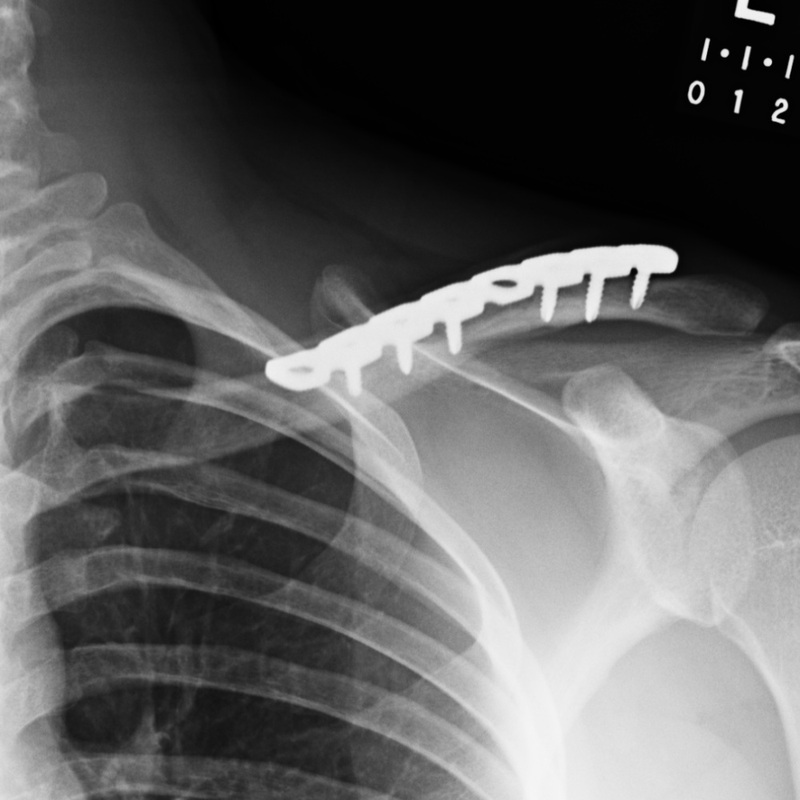 If the chances of the bone to heal or for the fixation to last long enough for the bone to heal is not adequate, it may be a smart choice to discard those pieces and replace them with a new metal part. The classic method is to replace the ‘ball’ part of the fracture and rebuild the other pieces around it. This method relies on those pieces healing around the metal- bone tends not to do so very often. 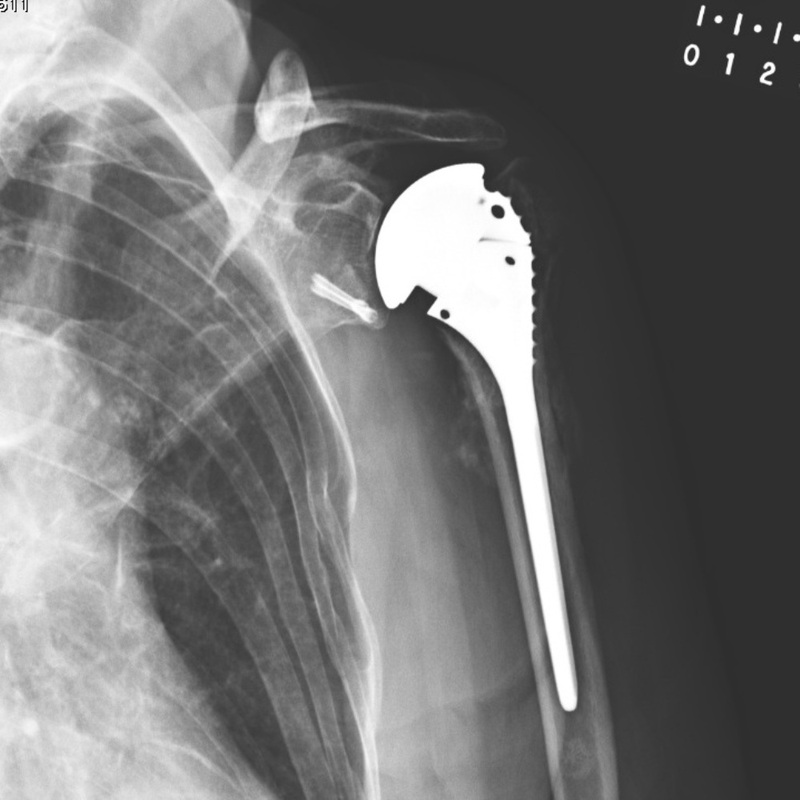 X-Ray of the proximal humerus (the ball) , following an up-side-down replacement (officially called reverse shoulder replacement): The ball is on the socket. 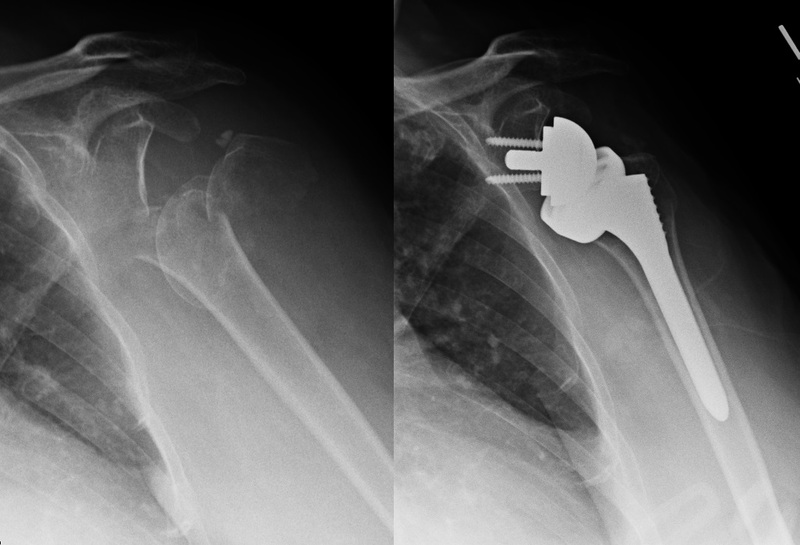 The more advanced option for this type of fracture is to turn the shoulder up-side down, and put the ‘ball’ on the socket side. This takes away the reliance on bone healing and allows earlier return to use. The down side is that it is a newer design and is not meant for heavy use. It better serves patients with low demand/sedentary lifestyle. A shoulder separation refers to the AC joint: where the collarbone (clavicle) meets the furthest point of the shoulder-blade (acromion). 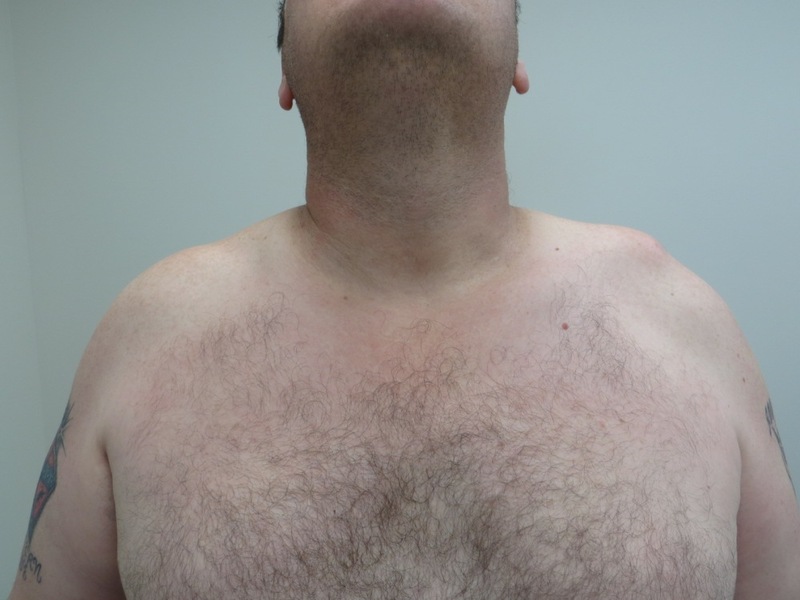 With an impact to the acromion, the collar-bone may separate, that is, lose alignment, and usually rises above the acromion. The patient will then have a painful knot at the point of the shoulder, and it may or may not be mobile. A separation has several grades, but can be easily be broken down to two: The two bones are either touching or not. If they are touching, although not exactly perfectly aligned, surgery may not be necessary and is usually not warranted. If they are not touching, surgery may be necessary. The shoulder is the most mobile joint in the body and allows the hands to reach into many different directions. This comes at a price- it is the least stable, and most prone to dislocate. A dislocation means the ball of the shoulder is all the way out of the socket. When it first happens, it is usually an intense event. Most people need help to put it back in place (called closed reduction). After the ball is put back in place, it should be protected for a d of time to prevent it from slipping out again before the tissue and ligaments around it has had the chance to heal. After a period of protection, it is important to regain motion to prevent future stiffness. If the tissues have been substantially injured, fail to heal, or if there is a fracture involved, the shoulder may dislocate over and over again. The more frequently it dislocates, the easier it does that. Once 2 or more dislocations occur, surgery may need to be considered. 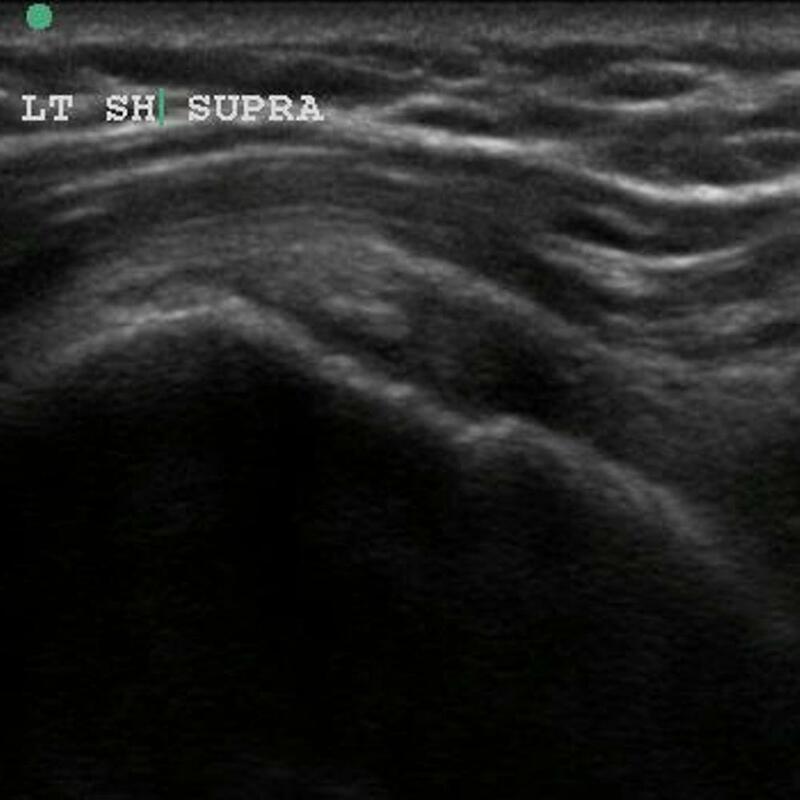 Rotator Cuff tears are common reasons for pain and disability. Most of them occur insidiously and progress with time. A few may happen suddenly, such as from a fall. The patient may experience popping, snapping, bruising, and typically immediate weakness and pain. This is an important sub-type of cuff tears, as it does not show on X-rays taken in the emergency room, and can easily be missed by the emergency room doctor or the primary care physician. It is also important because the tear is usually best fixed soon after the injury. Usually I recommend surgery within a few weeks to maximize healing potential and minimize time to return to function. Treatment plan, rehabilitation and recovery is similar to the more common chronic rotator cuff tear.